Patrick Wood was born on January 23, 1931, in Kansas City, Missouri. He enlisted in the Aviation Cadet Program of the U.S. Air Force on August 18, 1952, and was commissioned a 2d Lt and awarded his pilot wings on September 16, 1953. Lt Wood next completed Helicopter Pilot Training at Gary AFB, Texas, in January 1954, and then served as an H-19 Chickasaw pilot with the 2157th Air Rescue Squadron in South Korea from February 1954 to April 1955. His next assignment was as a helicopter pilot with the 327th Air Base Squadron and on the staff of the 327th Fighter Group at Truax Field, Wisconsin, from April 1955 to March 1962, followed by service on the staff of the 5700th Air Base Group at Albrook AFB, Panama, from March 1962 to May 1965. 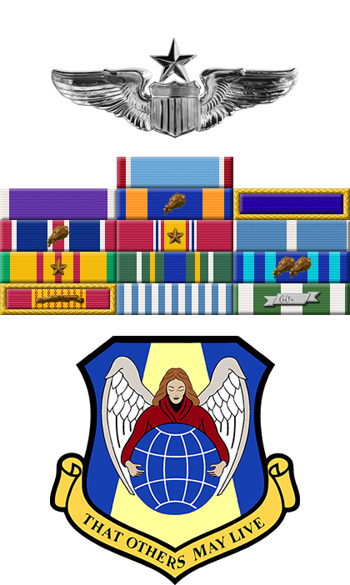 Maj Wood served with the 1375th and 1371st Mapping & Charting Squadrons at Turner AFB, Georgia, from June 1965 to July 1966, and then completed HH-3E Jolly Green Giant Combat Crew Training in September 1966. His next assignment was as an HH-3 pilot with the 38th Aerospace Rescue & Recovery Squadron at Udorn Royal Thai AFB, Thailand, from September 1966 until he was killed in action during a rescue mission on February 6, 1967. 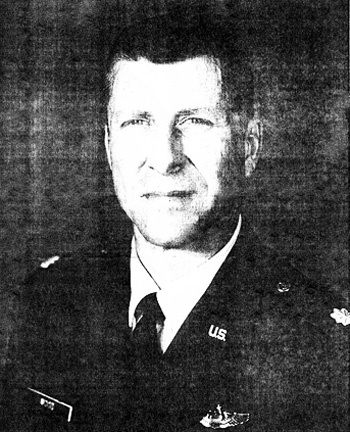 Patrick Wood was officially listed as Missing in Action until after the Vietnam War ended, and was promoted through the ranks to Colonel during that time. His remains were recovered in 2016, and he was buried at Arlington National Cemetery on June 28, 2017. Major Patrick H. Wood distinguished himself by extraordinary heroism in connection with a military operation against an opposing armed force as a Rescue Crew Commander of an HH-3E helicopter near Mu Gia Pass, North Vietnam on 6 February 1967. On that date, Major Wood flew two sorties in an attempt to rescue a pilot downed deep in heavily defended hostile territory. An intensive search under constant fire failed to locate the pilot and the first sortie was cancelled due to rapidly deteriorating weather. Major Wood undertook a second attempt fully aware that fighter cover and flak suppression support were unavailable due to marginal weather. Despite intense and accurate 37mm fire, Major Wood successfully located and hoisted the downed pilot into his aircraft. At this point, the hostile forces, thwarted in their attempts to capture the downed pilot, and the possibility of luring other aircraft to destruction, directed all their fire-power toward Major Wood's aircraft. Heavy 37mm fire exploded above the aircraft on climb out, and one hit was taken in the cabin. Although his aircraft was severely damaged, Major Wood attempted to clear a ridge line which would have provided a sufficient altitude for a safe bailout for his crew. In the face of a known highly dangerous area, extremely adverse weather conditions, and exceptionally heavy hostile fire, Major Wood pressed his humanitarian efforts to save a fellow airman. Through his extraordinary heroism, superb airmanship, and aggressiveness, Major Wood reflected the highest credit upon himself and the United States Air Force.